This Chips were thin and crispy. They provided a brittle snappy crash once bitten into. The initial bite was loud and snappy but after that the Chips quickly became pulpy. 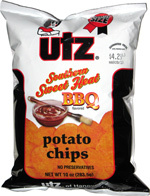 As with most of Utz Regular Chips, the cut of these saw a variety of shapes and sizes, but no major curls or bends like you would find in a Kettle Cooked bag. There were a few oil bubbles around, but not loads. There was a good and thick orange seasoning spread around at random. These Chips began in a slightly confusing fashion. There was a tangily sweet, but not sugary hot sauce flavor, with a helping of Barbecue kick. It oozed Southern Barbecue imagery. The confusion is that as well as being really very tasty, they delivered exactly what was promised on the packaging. This is rare in the Potato Chips and Crisps world.